Every business has financial transactions that take place. When looking to keep track of all of the business financial transactions, a business will need to use certain statements to do this. One of the most important documents a business can use is the profit and loss statement. This is a document that keeps track of all the companies’ income and expenses as well as costs of goods sold. 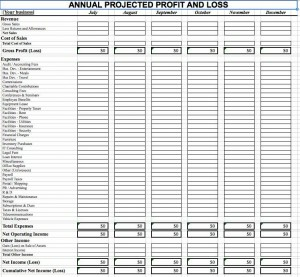 By using a profit and loss statement on Excel a company will have an easy way to track how well they are doing financially at all times. The first part of the profit and loss statement is the income. This is simply the amount of money that a company makes. When recording income on the profit and loss statement you will record what the company makes before and after its costs of goods. The types of income are known as gross income which is before costs and then the net income which is after costs and expenses. By keeping track of income on the Excel template a company will have the means to better evaluate their financial standing. When using an Excel template the next part of the profit and loss statement is the expenses. This is simply the amount of money you need to pay to keep your business in operation. The expenses usually include rent, utilities, advertising and insurance. It also includes salaries and payroll taxes as well. When keeping track of expenses you will have an easy way to determine how much it will cost to run the company. Using the Excel template will give you a great way to record the expenses on the profit and loss statement. As a business it is important to know where you stand financially at all times and therefore you should use this template whenever you are looking to have a business.